LA Orgs Join Forces To Support Students’ Dreams Of Going To College! 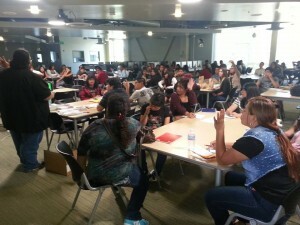 On October 4, 2014, ARE Los Angeles, MEChA de Maya Angelou, Union del Barrio, various Neighborhood Councils (Central Alameda, South Central, CANNDU, Voices of 90037), PAPEL, Mujeres Inmigrantes Organizadas, SCIC, etc. joined forces to support students’ dreams of going to college. The event was hosted by the Central Alameda Neighborhood Council. It was made possible by many individuals and groups who believe that every students has a right to a higher education! Big props to Martin Terrones, Adri Cabrera, Natali Cabrera, David Sotero Solis, Kelly Flores, Revo Grafia, Paul A. Hernandez, Jthagreat DeFrance, Felicia Gomez Verdin and everyone else who helped out! This entry was posted in 2014 Events, Barrio Youth News & Events, Local Community News & Events, Los Angeles News & Events. Bookmark the permalink.